If you are from Gejeret, then you might remember where the residents of that neighborhood in Asmara found refuge in 1975. I was one of those who took refuge at San Francesco or Collegio La Salle, which was administered by the Kerenite Fratelli, Fr. Michael, Fr. Kahsay, Fratello Beyene, and Fr. Demsas. Later, I heard Fr. Beyene joined the struggle but I’ve no information if he made it to Independence Day. Also, rumor had it that afterwards, Fr. Misghina quit the La Salle seminary, got married and left for Sweden. And there is more of such news. The year 1975 ushered a turbulent and terrible time for Asmara residents who hitherto escaped the ugliness of the raging terror that was being carried out by the Derg. Most people from Gejeret stayed at home during daytime, and when the sun was about to set, they moved to La Salle to spend the night. Usually in the late afternoon, most of the people packed necessary supplies, took along mattress and blankets, and bagged other items, and headed to La Salle to spend the night. After some time, that became the daily routine, people were convinced it was the only way to avoid falling victim and facing the unimaginable cruelty and looting in the hands of the Derg security forces, the Tor Serawti who became extremely active during the night. Two places became safe havens for the residents of Gejeret: San Francesco and La Salle; they offered relative security and peace. Meanwhile, many residents trekked to the countryside around Asmara where they found refuge and the rural areas were crowded with relatives and refugees from the capital city. My family couldn’t follow the footsteps of the other people since our ancestral village was entirely burnt down and razed to the ground. The destroyed village became uninhabitable for its residents let alone refugees from Asmara. Sometime later, for reasons I cannot exactly explain, all the people who took refuge at La Salle and San Francesco gradually stopped frequenting those place; they started to stay at home overnight. However, the risk that the Tor Serawit posed on their safety, was not over yet. Maybe that could be due to accepting fate—z’metse ymtsa’e attitude. It could also be that somehow, we were aware of Abraham Afewerki’s song long before it was released: “tsebaH ms Halefe Kullu”, meaning, “tomorrow, when everything is over”. We pretended to listen to the imaginary song because fate had to somehow be confronted and challenged. During that time, Asmara rarely had lights at night and the people also preferred dim candle lights to avoid detection by the Afagn Guad, (the strangulation teams) of the Tor Serawit in the evenings—dark houses gave them the impression the homes were uninhabited. As soon as darkness sets in, residents were supposed to speak sotto-voce, and all talks were whispers. One learned how to sharpen their hearing faculties and could discern the sound of the cars that roamed the deserted streets from other sounds. Outside, the air was so silent; inside the houses, even footsteps were not supposed to make a noise. We had learned how to tip toe. My mother was very careful; she would walk to the kitchen quietly calculating the position of every step she took, until she made sure the danger was over. Usually she would peek through the crack in the door and check the streets for extra assurance of safety. It was then that she passed her verdict. She would order us to either relax after so many tense hours, or continue to be silent and freeze where we were, depending on what she detected through the crack in the door. Wolde Giorgis (1985:51) who was a chief representative of COPWE(Commission to Organize the Party of the Workers of Ethiopia) in 1979, described 1975 atrocities against the Eritrean people by the Ethiopian government as follows: Young men and women were dragged out of their homes at night, strangled and thrown into the streets in what the death squads themselves called the “ Piano Wire Operation” Hundreds were killed in this terrible manner. The Ethiopian government crimes against civilans in the 1970s was reported by Dines (1978:2 ) and Wolde Giorgis (1985:51).Ato Irgau Bahta was one of those victms of the Ethiopian government. He was gunned down inside his home in front of his 7 children and his youngwife in March 1976 when the army shot dead 42 civilans in the capital Asmara. This was in retribution to the death of Colonel Bishu, who was assassinated by the EPLF fighters. 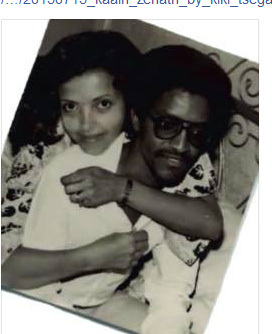 On the 28th of March 1976 an Ethiopian army Colonel, Bishu Gebre Tekle and his bodyguard, were assassinated by EPLF fighters aided by the colonel’s mistress Nebyat. Nebyat was the patron of a bar and lured her lover into meeting her at the entrance of her establishment. The ambush happened in the city center in the Eritrean capital Asmara, in the early hours of the evening. Nebyat and her young son along with the two fighters who shot the colonel escaped swiftly arriving safely in the countryside under EPLF’s control. (Connell, 1993). Ato Irgau Bahta lived in the same block where the assassination had occurred, alongside his wife, seven children, his mother and brother in law. Around 11pm that night members of the 30th brigade of the Ethiopian Army dispatched from the the Kagnew Station military base forced their way into Ato Irgau Bahta’s apartment and terrorized the defenseless family. It is believed the army unit was under the command of aShaleka Asmelash. After ransacking the apartment and stealing various jewelry items one of the soldiers shot Ato Irgau Bahta in the head. Ato Irgau Bahta was holding one of his young children in his arms when he was shot and fell on the ground alongside his child. His brother in law was taken outside in the street and shot at. He worked as an electrician with the Lo Russo company and was well liked and respected in the community. In the same night a young high school student, the only child of a mother that was employed as maid with an Italian family, was also killed by the same Ethiopian Army unit. He was shot and his body thrown from the third floor of the building where he used to reside. He lived above the premises where the Ethiopian colonel had been ambushed. At least eight other individuals were executed by the Ethiopian army on the night of March 28, 1976 in the city center of Asmara. The next night, March 29, 1976 more civilians were rounded up and executed by the Ethiopian army. At least twelve bodies were dropped and laid around the block were Ato Irgau and his family lived. The funeral procession of Ato Irgau Bahta could not proceed until the bodies were removed later on the next day. It is believed that many of the victims of the second night were civilians whose names were found at Nebyat’s bar in a book where she kept the names of individuals that owed her money, a common practice of local businesses. Alem Beka Prisoners' story Par 1. Alem Beka Prisoners' story Part.2. 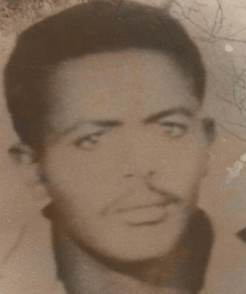 Berhane was arrested and killed 1 month after his arrest on July 1978. At that time Mariam Gimbi did not exist. They were taken to Enda Afras and then Sembel. Either for court (Chelot) or execution. The ordinariness of the surrounding places and the suburban areas makes “Enda Afras” even more difficult to accept, for this place is the symbol of humanity at his worst. 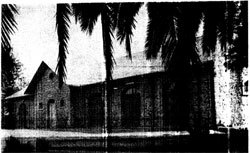 “Enda Afras” torture room and the former prison under the Ethiopian occupation is located in the heart of Asmara, the capital city of Eritrea. When you look at this place from outside, it has a grassy area that calls for kids to play and run from on end to the other. 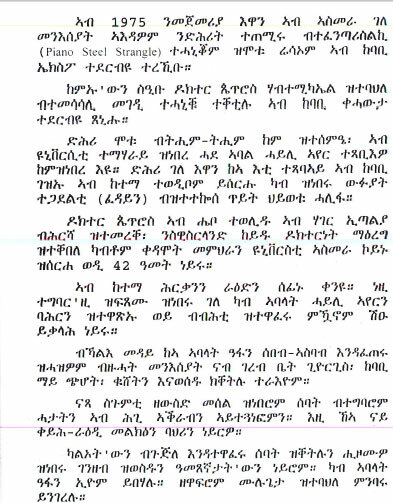 You see, Enda Afras” means “stable for horses” and it is part of the compound formerly hosting the Ethiopian Emperor’s palace, during the occupation of my country – Eritrea – by said Emperor and his government. The gardens were beautifully tailored to meet the tastes of the Emperor and his royal family vacationing in Asmara. The leaves of palm trees surrounding the palace, shifting benevolently in the afternoon breeze. 1.Faraa from Asabaina brick store owner, 1980 killed for his money and property. 2. Ghebre Luul (Shambako) gardener 1980, killed for his money. 3. Tesfai, flour mill owner of Bimbilna, 1980 killed for his money. was killed in cold blood while begging: Kona Kebini dedame, these were his last words. 5. Abel Musa (Cadre) killed in Bimbilna for his different opinion, in Dergue regime. 6. 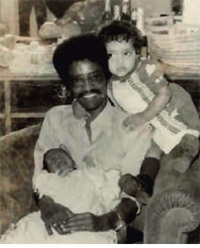 Mahamed Bedani and his son killed for his money, 1978. 7. Manga Ali from Fode who was a war prisioner was killed in 1979 in Kolluku. ክብሪን ሞጎስን ንስውአትናን ስንኩላትናን ንሐርበኛታትናን. Atrocities were also reported between April and May in several parts of the provinces of Hamasien, Senhit, Akele Guzai and Serai. In esacaping from these atrocities the number of internally displaced Eritreans rose to 100, 000 in 1988 - 1989, with approximately 40, 000 fleeing to Sudan from the coastal regions.